All fire systems installed by us are fully compliant with European Standards.We provide a large selection of fire alarm systems from all the leading makers of fire detection and control equipment. From simple conventional devices to advanced analogue addressable systems. One of our dedicated and experienced security consultants will be happy to talk you through the process, from planning through to installation, with all advice based on your individual and specific requirements. Every device links back to the panel and communicates with it. In addressable fire systems every single device can be interrogated and analysed from the panel. This is very useful when system testing and fault finding. Another advantaged of this type of system is that you can isolate specific devices rather than whole zones which will allow for phased evacuation procedures which are particularly useful in large buildings. Also intelligent systems allow for phased evacuation procedures to be programmed into the system. Conventional systems are not as intelligent and can only see faults or fires in certain zones and not a specific area as with addressable systems.Remote Terminals are also available which allow information to be distributed throughout a building. This is typically information from the main fire panel or specific information about the area the remote terminal is situated. This is the point of contact with a fire. Detectors can either be used to detect smoke, heat or both. When there is a change in air particles (smoke) or heat in the local environment the detector will be triggered which then sends a signal to the panel indicating a fire. 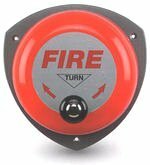 There are also Beam Detectors which detect smoke in large areas such as a warehouse and Flame Detectors which detect flames by analysing the characteristics of flame movements. Sounders and Beacons provide audio and visual indication that there is a fire. In most cases sounders are used. However certain circumstances arise where sound levels may be high enough that a sounder will not be heard so a beacon is used instead. This is usually the case in plant rooms where loud machinery operate, or perhaps where a sound alarm would be inappropriate such as in a sound studio or hospital operating theatre. It is also useful in places where persons with impaired hearing may be present such as a disabled toilet.